Johnny starred in Formula Ford before Eddie Jordan signed him for Formula Three in 1987 and he promptly won the British title. He was set for the 1988 Formula 3000 title when he suffered horrendous leg injuries at Brands Hatch on the day he had signed a Benetton Formula One contract. He finished fourth on his debut in Brazil, but his shattered heels could not cope with braking on the tighter tracks and he was dropped. 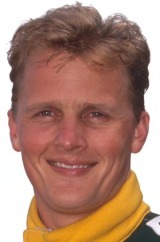 Peter Collins signed him for Lotus for 1990, and there Johnny stayed until 1994. A move to Benetton in 1995 was seen as his big chance, but the team focused on Michael Schumacher. Johnny inherited wins at Silverstone and Monza, though, to end up fourth overall. He raced for Sauber in 1996 and pushed Heinz-Harald Frentzen, becoming the team's number one for 1997, but a lack of testing slowed the team and Johnny did well to salvage third in Hungary. He continued to shine in 1998 but, after moving to Stewart for 1999, scored a surprise win at the Nurburgring. Since his farewell season in 2000, Johnny has starred in sports cars, racing for Audi in the US and finishing second at Le Mans for Bentley in 2003. Johnny was lured back to Formula One in 2005, as sporting relations manager for Jordan.